The next episode will cover Donkey Kong and Donkey Kong Jr.
As always, you can send text or audio feedback on these games, previously covered or general Atari 7800 stories and thoughts, both past and present to atari7800podcast@aol.com. I will be taking a break for a little bit while I have some family in town, but plan to release the next episode in about 4 weeks. This is a great time to get caught up on old episode and send in any feedback you got! Yes it is! My original recording got messed up, so I had to re-record it. The audio on the podcast and the video you will see in my eventual review came from my recording that night. The next episode should be out in about three weeks. This also featured an audio submission from Justin!!! EXCELLENT episode, No Swear! Thank you for letting me get to be part of your podcast! You are always welcomed back as I'm sure you have more thoughts or stories about the games. And that goes for other IO members! Feel free to write in sometime! good listen nsg, I have to look for mario bros on ebay, so upset my cart got swiped at my show. So, there has been a delay, but I hope to record soon. The next ep will cover Motor Psycho & Fatal Run. I might be able to get it done by next week. Ep 22 of The Atari 7800 GBG Podcast covering Motor Psycho & Fatal Run is now on iTunes and YouTube. The next ep will cover Tower Toppler and Alien Brigade. You can also send any 7800 Christmas memories, if you got any. If you send it by Dec 19 at 6pm EST, it should make the show. A wanted to give a special thank you to Brett Weiss for sending in an audio submission for the next episode! If you have feedback or Christmas stories for the next episode, please send them by tomorrow. I got you a new episode covering Alien Brigade & Tower Toppler (also on iTunes). The next episode will cover Jinks & Xenophobe. 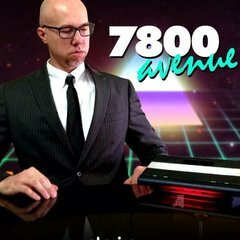 Ep 24 of The Atari 7800 Game by Game Podcast covering Jinks and Xenophobe is now up on iTunes and YouTube. The next ep will cover Ikari Warriors and Barnyard Blaster. The Jag Bar loves the show!! Keep up the good work, and keep em coming. Ep 25 covering Barnyard Blaster and Ikari Warriors is now up on YouTube and should be showing up in iTunes soon. I always felt Barnyard Blaster was an under appreciated game in the 7800's library. Ikari Warriors was sublime. Both games in my opinion played to the NES' strengths and tried to show that the 7800 could do what the NES was doing. Had Atari done more of this and been serious about it maybe things would have been a bit different for the 7800. Thanks for posting! Ep 26 covering F-14 Tomcat and Super Skateboardin' is now up on YouTube and should be showing up in iTunes soon. The next episode will cover Sentinel and Ninja Golf! Great to see new episodes coming! Ep 28 covering Sentinel & Ninja Golf is now available! Ep 29 is FINALLY out covering Meltdown & Scrapyard Dog through iTunes and YouTube. Ep 30 is now up covering Basketbrawl & Midnight Mutants on both iTunes and YouTube. I have now covered the entire library of officially released games! The next episode will cover the prototypes Klax, Missing in Action, Plutos & Sirius. In this special episode of The Atari 7800 Game By Game Podcast, I am joined with Greg from The SNES Podcast and Jim & Sean from the Pie Factory Podcast as we take turns picking games in my first ever Atari 7800 Draft Special!